Summer is here! Kids are happy to leave school behind, to play & frolic in the sun and to just have FUN. That doesn't have to mean an end to learning and frankly, it shouldn't. The best thing you can do for your kids is to keep them learning, even if only for a few minutes a day, to ensure that all that hard work they put in all year long isn't lost. So how can you get your kids motivated to learn when all they want to do is play? Make learning part of their fun! When learning is fun, it doesn't seem like work. 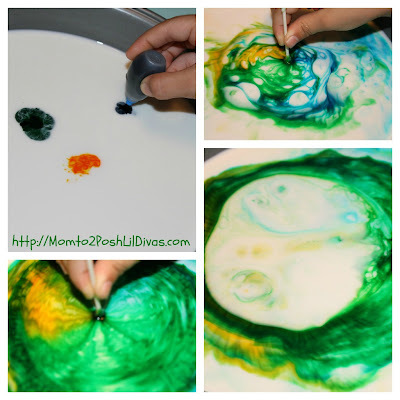 Your kids will enjoy doing it & be learning at the same time - how sneaky is that?! Today, I am super excited to share a fabulous Summer Learning Program from my bloggy friend Rachel over at Sun Scholars - The Sun Scholars Summer Program. Rachel worked long and hard on this program and it is a phenomenal program. There are so many activities I would love to try with the Lil Divas. I let the Lil Divas take a peek at the program and they picked out the Color Changing Milk Experiment which is part of week 4's theme - MIce, Cookies & More. Have you done this yet? It's so easy & fun. The Lil Divas loved seeing the reaction take place and I really enjoyed the extensions Rachel included suggesting comparing different types of milk and water to test the reactions. To conduct the experiment you need milk, food coloring, dish soap, a cotton swab and a dish. 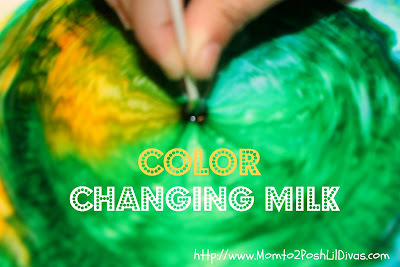 Fill the dish with some milk, add drops of food color in the middle leaving some space between them but having them close together. Dip the plain half of the cotton swab in the middle and note any reactions. Then, dip the other half of the cotton swab in dish soap and place it in the middle of the dish. Watch the reactions now! It is amazing! Once the swab has been removed note what happens. The Lil Divas were amazed. The Sun Scholars Program is filled with so many wonderful activities and opportunities for learning. Rachel is selling her program for $30 and it includes all the printables, easy to read/follow activity cards, supply lists and everything is super organized and step by step for you. What a time saver! Rachel even offers a free sample for you to test the program - week 7: Secret Agents in Training. So I urge you not to pass up the opportunity to check out the program for yourself. Would you like to know what is even better? Rachel is giving away the entire program to one (1) LUCKY Mom to 2 Posh Lil Divas reader! YES!!!! I am going to keep this super simple for you. 1. Who would you like to win the Sun Scholars 12 Week Summer Program for? 2. Which of the 12 week themes are you most excited to try based on the titles? Giveaway will run until Sunday, June 17, 2012 at midnight. Disclosure - I was given the Sun Scholars 12 week program free of charge in order to facilitate this review and giveaway. All opinions are 100% my own and based on our personal experience with the program. I would love to win this to use with my grandkids. They would love it. Love to try Space Explorers! I would love to win the program for my son. He will be a 1st grader next school year. My son is obsessed with mysteries so I think he would like Week 7, Secret Agents in Training, the best. I would love to use this with my younger boys. Several weeks look interesting, so it is hard to choose. I think I would like to explore The Great Outdoors first, however! I would love to use the program with my daughters and my homeschooling co-op. I think Hocus Pocus and Fun with Fairytales sound exciting. I would love to use this program for my 2 little ones that I homeschool, they would love this. I like secret agents in training. My kids are big into animals, so Animal Fun would be right up our alley. We would love to have some summer fun with this program! My 5 and 7 year old would love this! This would keep my 3 active boys busy all summer :)I really like the title "Mail Mania" because who doesn't like to receive mail? I have 4 cute little kiddos who would love to do some super fun activities. They all look so fun...but maybe hocus pocus. I would love to do this with my son over the summer. The one he would like to try the most would actually be a tie between Space Explorers and Secret Agents in Training. My son just finished kindergarten and loves themed weeks I would love to be able to win this for him. Space Explorers looks like it would be the most fun for my son. I would love to do this with my daughter to prepare for Kindergarten. I think Animal Fun would be our favourite. I think I'm most interested in the Beach week, since we're just an hour away from the beach! What great ideas for summer fun with the kids! Thanks for the chance to win the program! I bet "Secret Agents in Training" will be a big hit with my boys! I would like to win this for my daughters (a rising kindergartener and a rising preschooler). Thank you! I think they would enjoy Mail Mania the most. They love receiving things in the mail. I would love to win this for my rising kindergartener. The more activities the better! All of the weeks sound exciting but I think my daughter would enjoy week 7 the most. Id love to win the Sun Scholors 12 week learning program for my 3 (almost 4) year old daughter! I'm at a loss as to what to do to teach her new and FUN things this summer! Please help! My girl is such a diva, and loves Fairies, so I think she would be super excited for that week! She is such a smart girl ( because of her "thinker" she says!) that I know we would really enjoy every wheel! I'm part of a large local mothers group in Ca. And I'm going to definately recommend your blog, and this program ! Secret agents in training looks like something my son would love! I run an indoor summer camp and I would LOVE to use this with my campers! I stumbled upon your blog while searching for Eric Carle ideas, and whoa, I am in loveeeee with everything! Hi! I'd love to win this to do with my 4 year old son this summer. I think Mice, Cookies and More sounds interesting - thanks!